Provision and protection are my words for 2018. Do any of you pick a word to be your theme for the new year? Up until this year, I haven’t had one this early. Why? Well, the pressure of trying to live up to a word I pick just overwhelms me. What if I pick the word “joy,” for example, and then as things happen in our year, I forget to respond with joy? I would fail (It’s just the way my mind works…) So, what I do instead is wait to see how God brings certain things into my year and ask Him to show me what He is doing. It usually is a few months before I see a theme going through our lives. Today is January 9, and I already have not one, but two words. Yes, indeed. We have jam-packed so many events into the first week-and-a-half of this year, that I already know what God is trying to show me. It started on New Year’s Eve. We had family over and were going to celebrate with them by making homemade pizzas, shooting off fireworks, and having a bonfire. But first, I thought, let me throw a load of clothes in the wash so I can stay on top of the laundry. We have a front-loading washer, and basically it broke mid-wash, which means we couldn’t open the door. 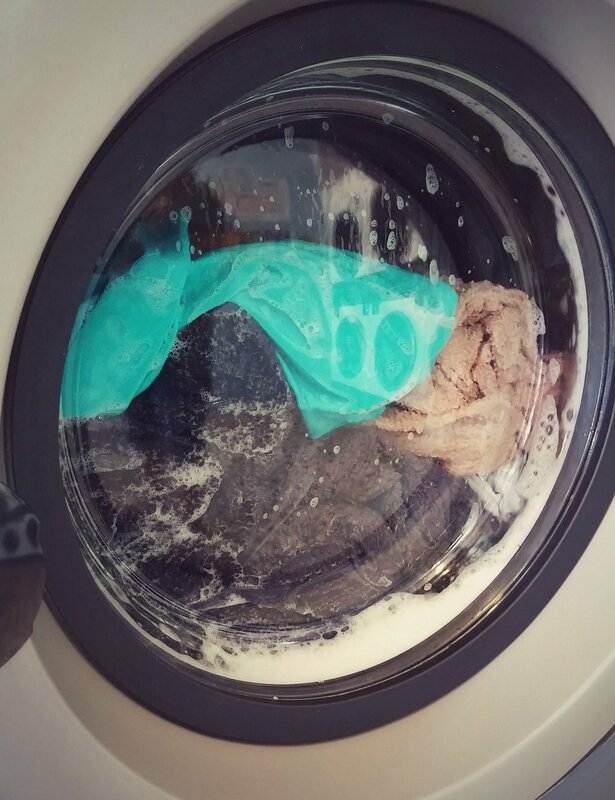 You see, a front-loading washer cannot be opened if there is water inside it – it stays locked. So, after my husband tried several things, he finally had to rig a wet-vac hose and some plastic cups to vacuum out the water so we could open the door and figure out what was wrong. Long story short, we had to buy a new washer (which will not deliver for two weeks!). So, no laundry. Amidst that, my husband came down with a 3-day cold bug that knocked him out. One-by-one, it made its way to each of us (I am just now able to get back on my feet). You can imagine the difficulty of not having a washer while you have sickness in the house! Oh, and did I mention that our air conditioner/heater unit broke? Yes, we had to have the repairman out here THREE times to finally get it fixed. Meanwhile, we froze while we were sick (Florida’s 28-degree cold snap hit for a couple days during this time). Next in our continuing saga, our shower handle broke off the wall. After Dave tried to fix it, he realized that it was a broken cartridge, and that it required a plumber to repair it. The grand finale was a car accident. While I was trying to sleep off a fever and stuffy head, my husband was running errands and was hit by a red-light-runner. Thankfully, he was not hurt, but because of the angle of the impact, four cars were involved. The entire front end of his car (both sides and the front!) was smashed. Oh, and the driver at fault was driving with a suspended license and has no insurance. So here we are, nine days into 2018, with a long to-do list that I was not planning on. It includes germy laundry piling up that I can’t wash, repairmen for the a/c-heat and shower, new washer delivery (can’t wait until Friday! ), paperwork for the car insurance company plus taking the car in to get an estimate on the damage (praying it won’t be totaled – it’s paid for), all while trying to recoup from the last few days of feeling like I was a limp piece of spaghetti. Well, I could certainly mope and wallow in this terrible beginning of the year. But I know there is something else happening. You see, even though we have things breaking, we do have the ability to replace them. We had to do a bit of financial shuffling, but we can still do it. So, I am grateful for God’s provision. The sickness? Well, I know many people who deal with continuing illness daily. As I was sick, I was pretty sure that in a few days, I would be better. What a blessing that God protected me and my family from getting something worse. And the accident? If my husband was just a few feet further into the intersection when he was hit, he might have been terribly hurt. I know that God protected him. So instead of asking God why he would allow all this mayhem to happen in the last several days, I am realizing that He protected and provided for us. He protected us from getting a sickness that was worse than what we had. He protected Dave by keeping him from getting hurt. He provides for us so that we can fix the things in the house that need fixing. He is present. He is engaged. Therefore, protection and provision are my words for the year. I know they can potentially involve drama like we’ve already seen, but what a wonderful God we have who knows our hurts and our difficulties. As the events of this year unfold, then, I choose to look for his provision and protection in it.